TRIVIA of Noh : Q87 : Are there any solo performances by Noh musicians? | Home | Trivia | Q87 : Are there any solo performances by Noh musicians? Are there any solo performances by Noh musicians? As you see solo performances of actors like su-utai (a Noh performance without music or dance) and shimai (a Noh dance performance in plain costume), there are performances of Noh musicians that feature each musical instrument. In Noh plays, musicians employ three different types of percussion, namely kotsuzumi, ōtsuzumi and taiko. When a percussionist gives a standard performance with an actor, it is called dokko or dokuchō. When a Noh flute player plays solo, the performance is called ikkan. While percussionists play the drums in dokko (or dokuchō) as they do in usual performances, there is another style of performance in which they play the drums in special ways for the actor. This is called itchō. Here, the player gives a special performance of a single instrument in a manner consistent with the atmosphere of the play, while also covering the parts usually played by the other percussionists. Therefore, the performance becomes unusual and more complex, and you can enjoy the character of the musical instrument and the performer's powers of expression. Performers have to be of a high calibre to give such solo performances, and they cannot give ones readily because they need to get approval from their superiors. 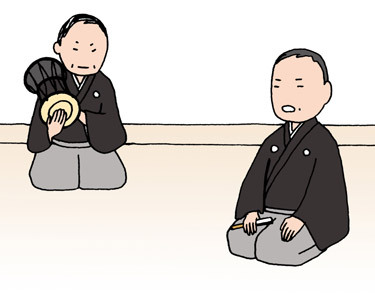 Each Noh music school has its own repertoire of itchō, covering a number of highlight scenes. There are also some variations of solo performances: itchō-issei is a session by an actor and a percussionist including a part of chanting not accompanied by the percussionist; itchō-ikkan is a variation of itchō that is accompanied by a flutist; muyō-itchō is a performance only by percussionists. These performances communicate the excellence of the musical aspects of Noh plays.